Thanks so much for stopping by today - it's my turn to post on the Peachy Keen Stamps Blog and I can't wait to show you the step card I made using several of fun stamps from this month's release. I had the most fun putting this card together! It was a long process and a lot of work, but I really love the way it turned out! * I started by making a step card out of Kraft paper. Next, I cut some waves I found in the Silhouette Online Store from white paper. I used my Copic Air Brush System to color them with some pretty shades of blue. *For the middle layer, I hand cut a couple of layers of "sand" from some kraft paper, inked it up and covered it with clear glitter. * I added the beach ball, sand castle and starfish to this step (these images are all from the PKSC-18 stamp set). * The 3rd step was made with more "sand" and I air brushed my sunshine and sky. * The darling little Hula girl (she has become one of my all time favorite PK stamps) is from the Rock a Hula (PK-1254) stamp set. The guitar is also from this set. * The coconut drink, starfish and sentiment are all from the PKSC-18 set. 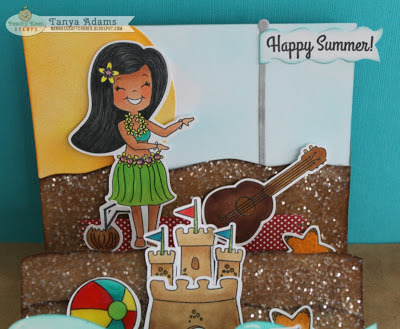 I think this card is just going to sit on my craft desk so that I can crank up the AC, turn on my Buffett tunes and pretend I'm on some tropical island enjoying the sea breezes with my little Hula Girl friend! Until next time......ALOHA! Tanya, this card is so super cute with all its beachy flair! I just love it! Fabulous step card...wow...what a great scene!! OMG, this is too cute. Love the images and cute scene you created. Tanya ~ Okay your post is too funny! Well I can TOTALLY see how this card took some time! All the different details are so STUNNING! I LOVE how you have your sand sparkle! Of course your coloring is AMAZING! So as I leave your blog all I can say is ALOHA back and singing some Buffet songs! LOVE that man! Fabulous & Fun!! Awesome step card! Adorable details...Love it! Oh how I wish I was on the beach right now. Love your card. Holy smokes girl..this is FANTASTIC!!! Wow, what a FUN card! 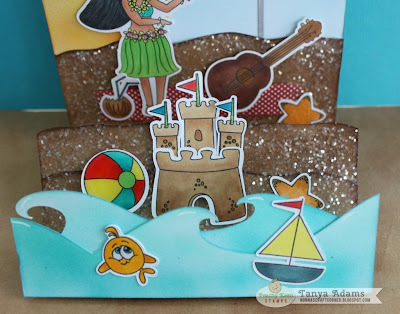 I love the beach theme and even though it took some time...the end results are AMAZING!!! I just got the PK set and now if I could only find some time to play with it...UGH! Hopefully, next week I will have some spare time when my company leaves. Have a great evening my friend! Now, I am off to listen to Jimmy Buffett(one of my fav's, grab a glass of wine and head to the bonfire with my family! Well look at you miss crafter! WOWZER! Another Fabulous card! All that work you put into it made it totally worth it! Makes me wish I was on a beach somewhere! love, love, love it Tanya! This is fabulous, Tanya. You used such cute images. 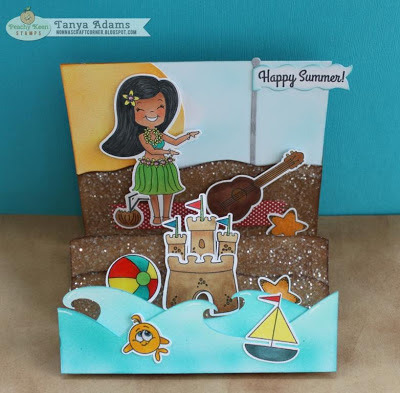 (love the waves, colored beautifully) You do such a fantastic job of cutting out your stamped images. That's an art form in itself. 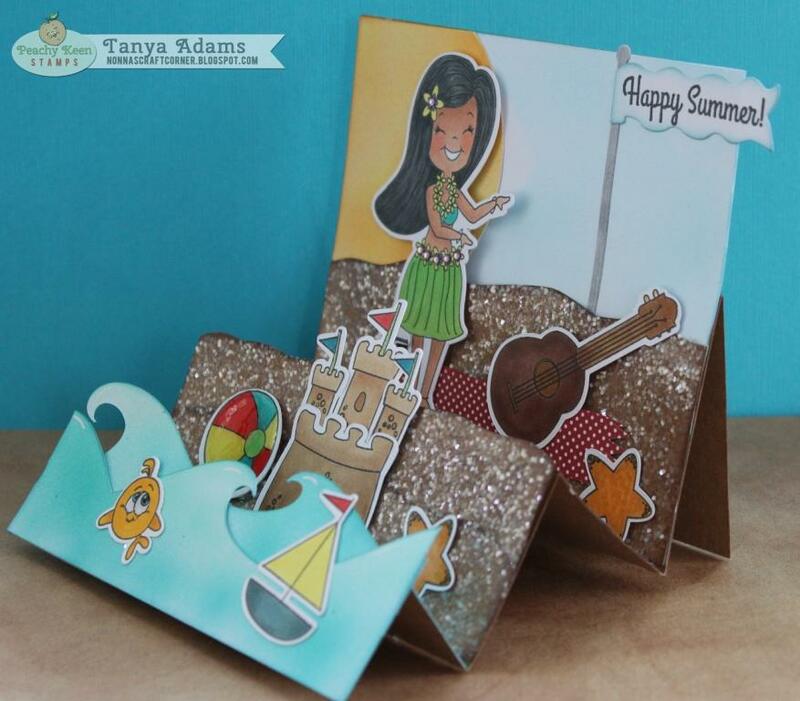 Wow Tanya, this is amazing!! Love all the layers and the glitter. It turned out fabulous. I posted over at peachy but forgot to come by and just tell you how much I loved this card! It's quite amazing my friend! Hope you are sitting by the pool! This is just amazing love the beachy scene you created!! You work so amazingly with Peachy Keen!